The Creamery has been a favorite of mine for years. Both the Palo Alto and the Stanford restaurants feature the same menu. The Stanford store is usually packed at lunch with a line out the door. On Sunny days they have patio seating in the shadow of Bloomingdales. The crowd is an eclectic mix of ladies at lunch, tourists loaded with shopping bags, families with screaming infants, Stanford students and business people. Breakfast is served all day, but the claim to fame is the burgers and shakes. The Palo Alto location used to try to give off a 50s diner vibe with naugahyde booths, a juke box and old-fashioned candy at the counter, but the music is now current pop and the vibe more present day, particularly at the mall store. I had never tried the Fountain Burger ($9.95 with fries). Strange, since it is the namesake burger of a burger joint. But in my guise of burger blogger, I felt it my sworn duty. So I dived in with relish. (Pun intended.) I also ordered Onion Rings ($6.95) and a chocolate shake ($5). The Creamery has table service and it is always quick and attentive. Clever slogans like "I am in the waiter protection program." grace the back of the servers' t-shirts. The Fountain Burger was a delightful concoction. Thick and smoky Hobbes bacon and grilled onions topped a fresh beef patty cooked to a juicy medium. 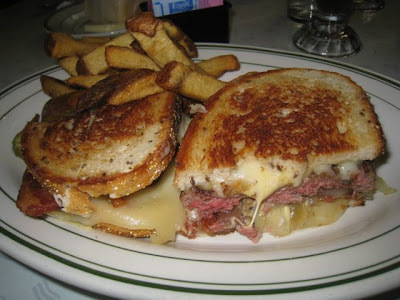 A mayonnaise sauce and melted Swiss also sat atop the grilled rye bread. The fries were thick and occasionally crispy with the skins left on. They were a little too darkly cooked for me. I was told that is because the recent batches have too much sugar in them. The large beer battered onion rings, Maui-style, faired better, especially when dipped in ranch dressing. The milk shake was killer - creamy, thick, cold and syrupy. When you have worked up a massive hunger walking the among piles of luxury swag at Stanford Mall, give the credit card a cooling off for a few minutes and enjoy a burger at the Creamery. Don't forget the original Creamery is found in downtown Palo Alto on the corner of Emerson and Hamilton. Best shakes in the world!